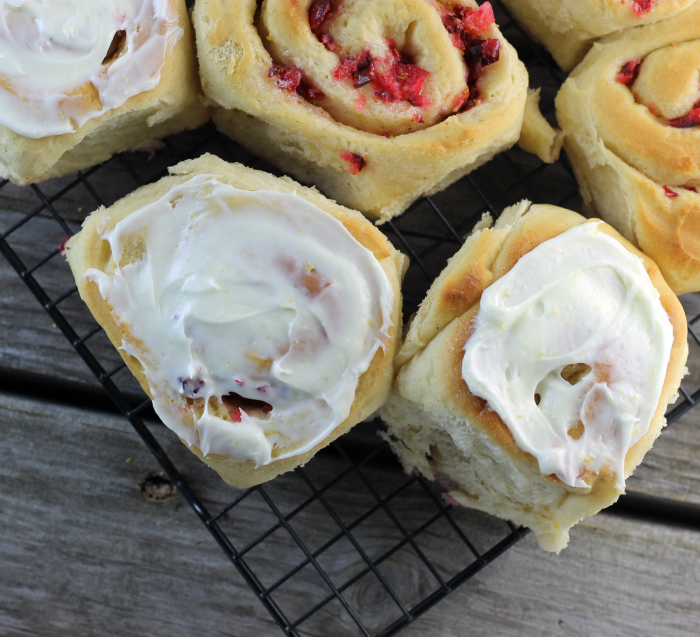 Brighten your morning with these cranberry orange sweet rolls. Perfect for Christmas morning, so festive! It was an odd day today. Everyone was either grumpy or kind of out it today. I was beginning to think that maybe we had a full moon going on or maybe it was the fact that it was Monday. Well, whatever it was I am happy to say that I survived the day and I am now in the comfort of my own home. Let me just add I just really hate any Monday, ugh! I am happy each week when Monday is behind me. 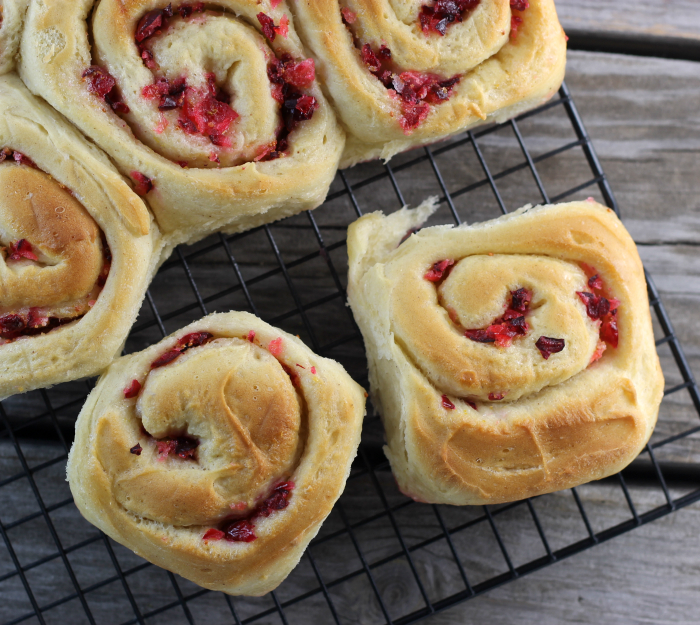 But, these cranberry orange sweet rolls can brighten any Monday. I am sure that these sweet rolls would bring a smile to the grumpiest person. Yep, that is how yummy they really are. The rolls themselves are soft and tender. Yes, then you have the cranberries and the orange flavor that is inside all of the soft sweet bread. And then to top it all off there is an orange cream cheese frosting, oh yum! They definitely are not your everyday sweet rolls. The cranberries are chopped up fine. I used a mini food processor that worked perfectly. They are mixed with butter, sugar, and orange zest. 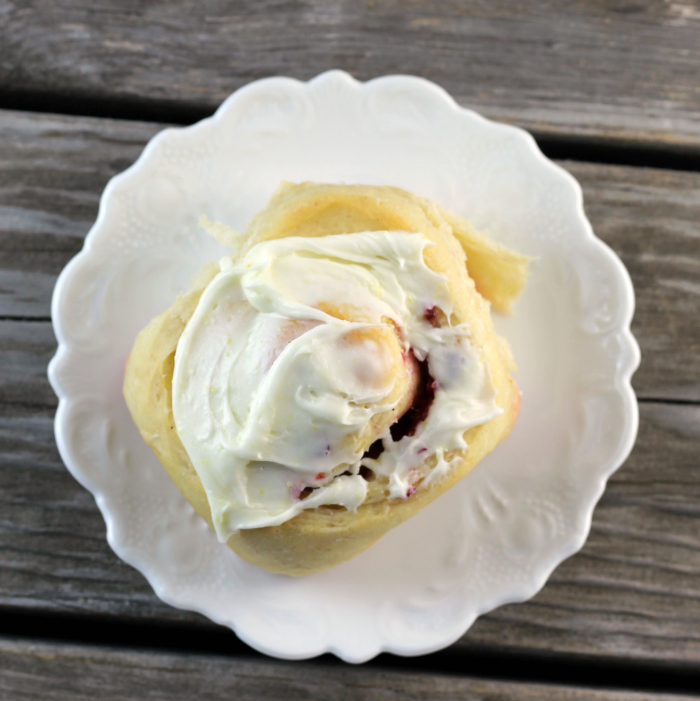 This combination makes a great filling for these sweet rolls. I love the color that the cranberries bring to these rolls. They look so festive, perfect rolls to serve on Christmas morning. Rolls- In a large bowl add yeast, 2 cups of the flour, 1/2 cup sugar, salt, and cinnamon. Heat milk, water, and butter in the microwave until very warm. Add the liquid to the flour mixture. With a wooden spoon mix until the liquid is mixed in. Add the eggs and mix until well blended. Gradually add the remaining flour to make a soft dough. I usually add a cup at a time. By hand, I work the flour into the dough. When the dough is just a bit sticky to the touch, you know you have enough flour added. Knead the dough until it is smooth and elastic, if you have a big enough bowl you can knead the dough right in the bowl. Once done kneading grease the bottom of the bowl with shortening, turn once to grease both sides. Cover and let rise for about 1 to 1/2 hours, so the dough has doubled in size. Once the dough is ready to shape into rolls divide into 2 parts. Grease your working surface with vegetable shortening and pat the dough into 12 by 10-inch rectangles. 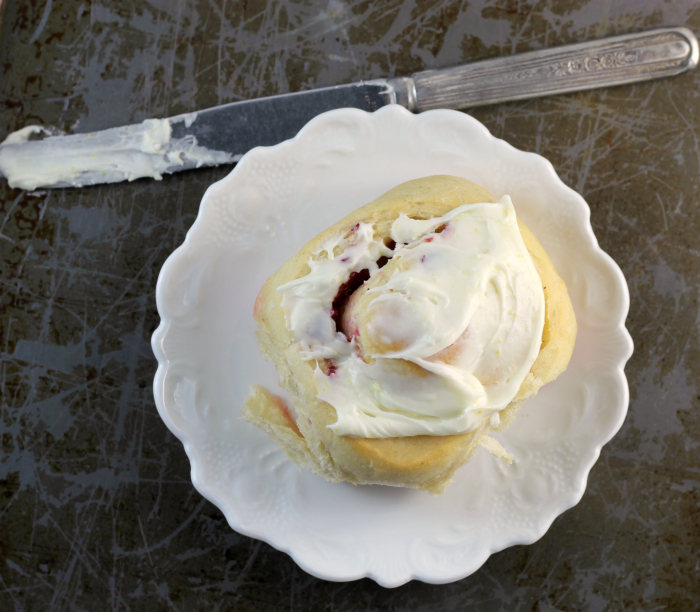 Combine the 1/2 cup softened butter with the sugar, orange zest, and cranberries, mix until well combined. Divided in half. Spread over the dough that has been patted out. Start with the short end, making to roll up tightly. Using scissors cut into 12 rolls. Place in a greased 9 by 13-inch cake pan. Repeat with the second ball of dough. Let rest for about 1/2 hour or until the rolls are almost doubled. Bake in a preheated 375 degrees F oven for about 18 to 20 minutes or the rolls are golden brown. Remove oven, place rolls on cooling rack to cool completely. Once they are cooled make the frosting. Frosting - In a medium mixing bowl add the cream sugar and butter, beat with an electric mixer until fluffy. Add the orange zest and juice and mix until combined. Mix in the powder sugar gradually until you have the right consistency for spreading. 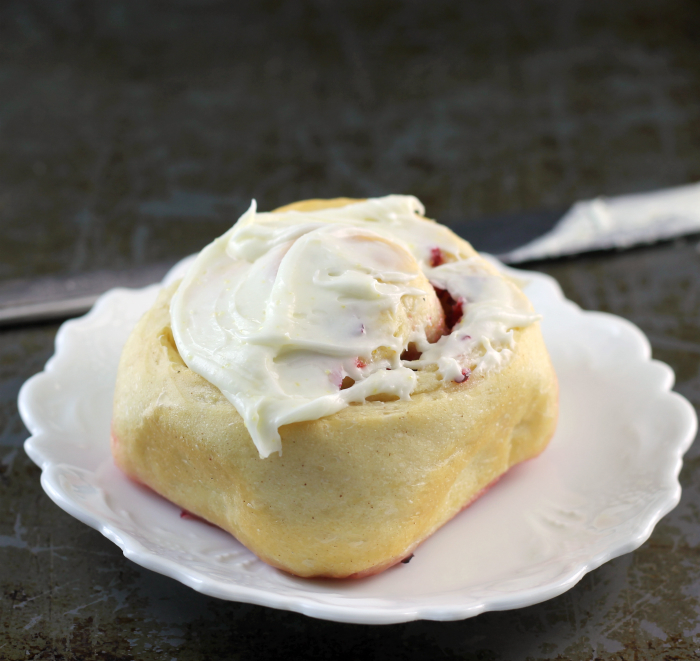 Spread frosting over cooled rolls. So delicious and festive..these are indeed perfect for X’mas morning. These rolls look amazing! Perfect texture, and I can only imagine how great they smell! These look terrific! What a fun way to use cranberries. And they work so well with orange, don’t they? This is a fun recipe — thanks. Yes, these gems would brighten up even the most dreary day. I was just lamenting that I hadn’t made any yeast breads in months—I think some sweet rolls will be on the menu soon! What a beautiful roll and such a nice change from cinnamon. This would make any Monday brighter!